This is the fifth in a multi-part series on using events as an avenue for marketing your brand, product, or industry. For part one in the series, start here. All of the OOTO auto-replies, air travel, car rentals, and hotel check-ins happened for this: career-changing content. Educational sessions, inspiring keynotes, and robust content are the indispensable core of any professional event. Plan these well, and you’ll be halfway home. Opening receptions aren’t just fun and games. They can be as constructive and informative as the sessions themselves. How? As Mary Poppins taught us, a spoonful of sugar makes the medicine go down. Receptions break down walls between strangers, allowing connections to be made and insights to be shared. Your reception should be optional. Many guests will likely be tired from a long day of travelling, while others will still be arriving. As such, your reception shouldn’t contain any vital announcements. Just let your guests enjoy themselves. Offer cocktails and appetizers and facilitate a networking or icebreaker activity. Your goal is to prompt conversations between attendees, hopefully encouraging discussion of the topics at hand. Want to make guests stick around even longer? Entertain them. A good cover band and dance floor will have your guests getting to know each other in no time. Tape the name of a celebrity (or industry icon, if your industry is large enough) to the back of each guest as they enter. As your guests mingle, have them ask each other for clues about the name of their back. The first to guess their own celeb wins a prize. Create a BINGO board with clues made up of quirks and qualities of your guests, like “red hair” or “wearing a neon color.” The game will encourage rapid circulation of your crowd, and in turn, fast familiarity. Task your attendees with collecting business cards in a set of five, as if playing Rummy. Perhaps company names beginning with letters A through E, or a set of five with the same first name. Your keynote speaker is arguably the single most valuable asset of your entire event. When you select your headline speaker, you’ll at the same time be selecting their fan base, their social media followers, their connections, their reputation, their insights, and yes, their words. A well-known keynote speaker could draw more attendees to your conference than any other effort you undertake. Who is the single most prominent name on your conference’s topic? Who do the major news outlets interview about your subject matter? Start there. If your first choice is unavailable, ask if they have anyone they’d recommend. Ideally, your keynote speaker will have a recognizable name. Without a doubt, other lesser-known speakers may be better presenters. But the marketing power of a famous name simply can’t be matched. This is your ultimate excitement-builder. If you aren’t excited about your keynote speaker, you haven’t found the right speaker. The keynote speech itself should be long enough to get people excited, but not so long that you need a break in the middle. 45 minutes to two hours is a good target. Any shorter, and those who travelled across the country to hear an expert will be disappointed. Any longer, and you’ll have attendees scurrying about during their remarks. Ideally, your keynote address will act as a driving force that keeps attendees interested—and in attendance—days into your events. The key to prime keynote scheduling is to keep it in the second half of your schedule. Schedule it too early, and antsy guests will cut town afterwards. Typically, general sessions include your entire audience. While the keynote should be inspirational and exciting, general sessions are designed to educate. This is one of the very few moments in time when industry jargon is allowed. Dig into industry news, controversies, and best practices. Share specific knowledge and insights. In other words, get wonky. If you’re promoting a product, this is the time to share your roadmap, discuss features and services, and dig into data. Then, get trendy. There are few things of deeper interest to any professional than industry trends. Where is the market going? What disruption is on the horizon? What opportunities are will accompany the change? A general session should last between 1 and 3 hours. Each day of your conference should include at least one general session, a daily opportunity for attendees to gather in one room and glean from a common set of insights. Breakout sessions present an opportunity to drill down even further into a given topic; a niche within a niche. Akin to ordering off an a la carte menu, attendees get to select the breakout sessions of interest to them. This allows for content with more tailored appeal. Yes, content that some may find boring, while others race for a good seat. Gather experts from your industry for an informal conversation, facilitated by a moderator between two and six professionals. Have participants share their observations of changes in the industry in a conversational way. Prepare questions in advance, but don’t be afraid to follow the conversation where it goes. Give your guests the opportunity to hear insights from their most coveted perspective: potential customers. From medical patients sharing personal stories of treatment in front of a room of healthcare professionals to readers of mommy blogs discussing how such writing has influenced their parenting, customer panels can leave attendees with invaluable understanding of their end-user’s point of view. Unashamed, no-nonsense self-promotion doesn’t have to be tacky. 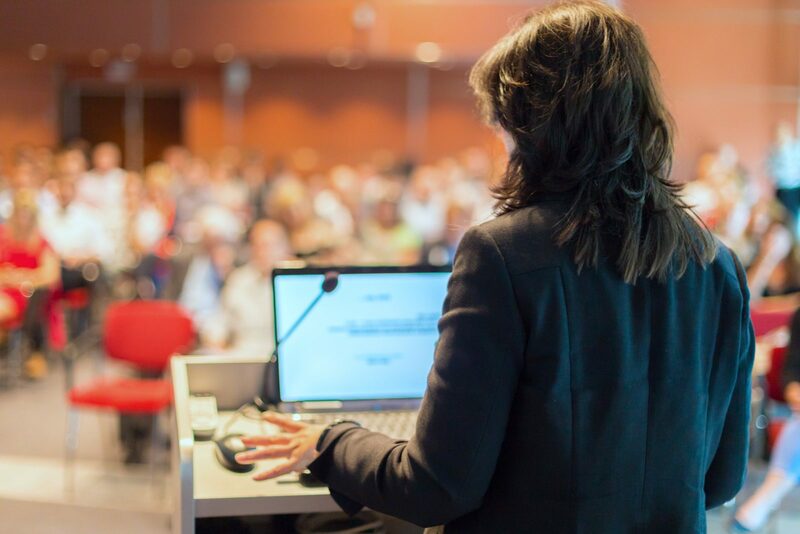 Assuming you secured relevant sponsors for your event, sponsors’ discussion of their latest products and services could be just as relevant to your audience as a thought leader’s keynote. Just remember to make these sessions optional, as to not appear to be pushing a sales pitch onto your guests. Informational sessions in a word? Data. Take a deep dive into the nitty gritty, whatever that may be for your topic. Back it up with data, and provide printed or digital copies of the data to attendees after the session. Make sure that the takeaway is clear; data without a purpose won’t be helpful. Attendees who learn today, stick together. Industry case studies are a great way to liven up an otherwise one-sided teaching moment. Select some case studies from notable universities or publications, then open them up for Socratic discussion among your professionals. Attendees will get to shine and learn, all in one setting. Entertainment should be incorporated throughout your event. Each general session should be capped with something lighthearted, like a comedian, musical performance, magician, or social hour. And don’t forget to use your evenings for social time. If you prefer not to be involved in the planning of such frivolity, arrange off site deals with local restaurants, bars, and activities.